Truth is my first victim. Earlier this month, I talked about one of my favorite cherry picks, the cherry blossom pick. Today, we are going to talk about one of the dangers of the cherry pick which is that the evidence you use today can be used against you tomorrow. That’s because over the short-term, climate change indicators can fluctuate all over the place and a short-term trend in one direction can quickly trend to the other direction. The good news is that the average Joe or Jane isn’t keeping close track of what you say over any length of time. Our goal is quick reinforcement of the idea that global warming is a hoax. That’s what sticks with people, anyway, not details and nuance. So feel free to cherry pick away and contradict yourself with abandon. It doesn’t matter if you talk out of both sides of your mouth. Notice how I got a nice jab in at scientists by mocking claims that sea ice is supposed to be melting. This tweet went extremely viral with 80 retweets and 30 favorites. I even scored big with a Mark Morano retweet. He’s one of the best known climate deniers in the business. Sweet! Antarctic sea ice flat lines. 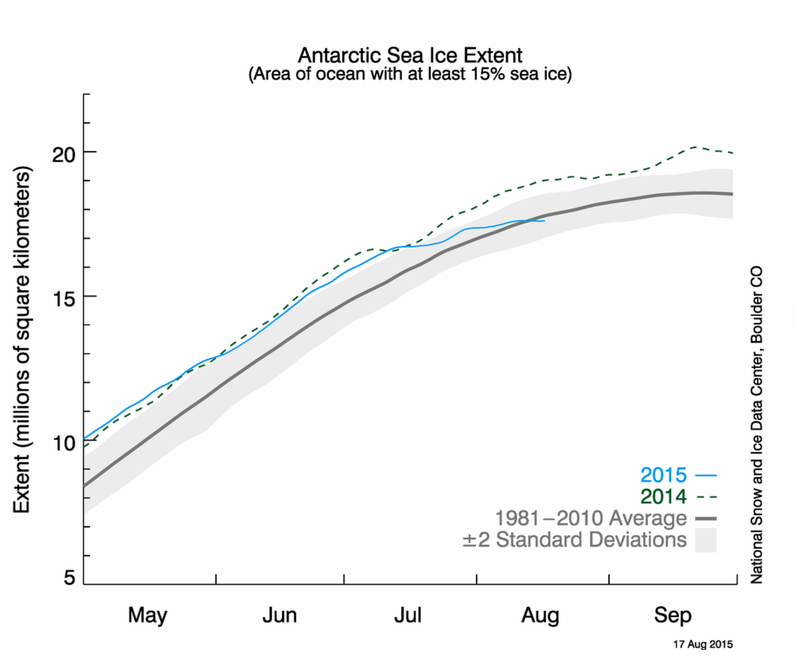 If Antarctic sea ice goes down, I mock scientists. If it goes up, I mock scientists. Heads I win, tails scientists lose! You’re probably wondering about the truth about Antarctic sea ice. Is climate change going to make it grow or shrink? It probably depends on what time scale you are talking about. Barring some drastic disruption to ocean currents, I imagine Antarctic sea ice will probably eventually start trending downward over the long term. But scientists speculate Antarctic sea ice can grow, over the short-term at least, as a result of local changing weather patterns brought on by climate change. But don’t ask me, I’m just a dumb denier. Read more about land and sea ice around Antarctica from a more reputable source.